One life rescued saves the world. One life taken destroys it. There were, naturally, grateful reactions from Jews and Jewish communities. And then, there were (inevitable?) reports that the entire event was staged, created by a media capable of ruthlessly playing on people’s fears and exploiting their hopes. Were there actually more than twenty Muslims present, some asked? Were some inside the gates and some outside? Were some difficult to identify because they were not wearing clothing that would clearly identify them as Muslim? Come to that, clothing doesn’t necessarily prove a thing, so… were any Muslims around at all? How were we to assess the fact that protesters spoke not only about the dangers of antisemitism but about those of Islamophobia? Reportedly, demonstrators chanted, “no to anti-Semitism, no to Islamophobia.” What were Jews to conclude? Were those demonstrators willy-nilly equating a merciless cultural pathology that had cost the lives of millions of Jews with something that could not begin to compare? To save one life, Talmud tells us, is to save the world. If we believe that, then a single Muslim showing up at any synagogue with holy intentions may well be, in our book, doing her best to save a life. If the only non-Jew present in Oslo had been Naustdal, coming to stand, as he said, “against all types of hatred, violence and particularly in this case anti-Semitism, both within our own ranks and from society as a whole,” that’s a life-saving intention. Just a short while ago, Jews could have shown up to support the single time allowed Muslim students for the recitation of the call to prayer from the Duke Chapel belfry. 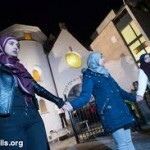 Right now, tomorrow, or next weekend, Jews could create their own ring of peace around a mosque in this country – maybe in Chapel Hill, where the community is mourning the brutal murder of three Muslim students. I could imagine Jews stating, proudly, that they are present to fight all forms of hatred, from antisemitism to Islamophobia because the latter also kills. If such Jews said: “we get your grief and we get your pain and we understand why you are afraid,” I would hope that we would not be accused of minimizing the pain we are witnessing by honoring and remembering the pain we have ourselves known. 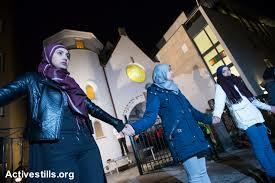 We should be inspired by the Muslims who showed up in Oslo, regardless of number. Imagine a world in which, every week, we showed up to protect one another. Imagine if we announced, day after day, that we must stand for peace and for life: Together. Imagine if we did not concern ourselves with “how many” but rather with hearts, with meaning and with intentions. We might save a life. We might save the world.